It is almost the end of 2017, and quite the year it has been! I have enjoyed this year with friends and family, and like life it has had it’s ups and downs. It has also now marked the return of someone extraordinarily unstable in my life. On this blog, in the past, I spoke about cyberbullying and cyberstalking. As in an adult who was doing this to me. They did it via Facebook, and Facebook has shut them down two times that I know of. This person was someone who was only ever in my life long distance. I never met them in person. They are related to someone I used to know. I thought they were nice, we even used to exchange Christmas presents. 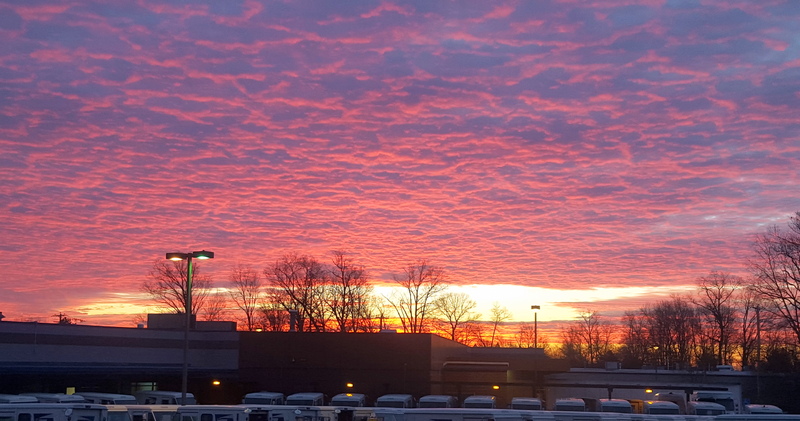 But as my old life waned and I recovered from breast cancer and life moved me to wonderful Chester County, as I fell in love again and then had my own family, they waned from my life. It’s like they were jealous and unable to be happy for me. Eventually this person decided they could not fit into my life and stopped communicating. At the time this saddened me, but relationships end. Then one day they were back. This was cyberbullying and cyberstalking attempt number one. They took whatever I wrote here and on the blog’s Facebook page and whatever else they could scrounge up by lurking on Twitter and they perverted it, distorted it, even oddly sexualized it. It went on for months. They even virtually befriended people who were politically opposite from me on local issues. Eventually Facebook shut it down because among other things they were doing all of this from way across state lines in another state not close to here. Though not enforced often enough, the Feds do have laws about cyberbullying and cyberstalking. Then this person went away, until it happened again. I found out last night they they are back yet again, because apparently they have been at it again for a few months and weren’t getting enough attention. Last night I found out they had actually reached out to a friend of mine via their social media page. This friend, who is no stranger to harassment for her beliefs, contacted me. We realized that this person has once again been out there for months. My friend commented that she put a lot of effort into harassing me. This time, rather ironically, she (yes it is a woman) has this site up about cyberbullying and elder abuse, so they can….well….harass me again. This time they refer to themselves constantly in the third person and although they aren’t, they are calling themselves essentially an at risk elderly person or senior citizen. They are maybe late 50s or tops 60. They are posting my private information like an old email address of mine which mostly collects spam. They have completely fabricated scenarios that are patently false and actually actionable. This is still a very sad, twisted, and angry person. They probably want me to take action because they want the attention. They are essentially obsessed with me. I am sure there were other people they have been fixated on, and I am certain I won’t be the last. I also doubt their family in Pennsylvania are going to be happy they are back at it and once again fixated on me. People are already reporting them to Facebook. Now Facebook is quite slow in dealing with cyberbullying and cyberstalking, but eventually they shut people down. I don’t know how many of these harassing pages this person will continue to create about me until they are finally stopped, but it will happen eventually. Sadly, I am once again learning that messed up people like this are very real on this planet. Their goal is to create misery, harass, and steal joy. I am as always, grateful for my friends and family and all of you my dear readers. hate has no home here at christmas or anytime, chester county. please. Hello. I came across some racist graffiti in Exton. It’s under the underpass at rt 100 and 30 bypass. It’s new as I travel the area frequently and don’t think it’s more than 2 days old. Not sure how to have it removed. Apparently they tried to call the police yesterday, but calling the non-emergency number after hours, is well, after hours. That is the problem with a centralized 911 system – you can’t just get someone from a local police department easily on the phone. In the old days, you could just simply call a local non-emergency number to report things like hideous graffiti. I don’t expect a Christmas miracle out of West Whiteland Township on Christmas Eve, but either they or PennDOT need to remove this as soon as possible. Hate should truly have no home here, especially at Christmas. Say a prayer for the person who did the graffiti because they need to lose the hate in their own heart that drove them to tag in such an awful way. 2017 has been a brutal year. My Christmas wish is for peace at Christmas and in 2018. All of this hate from coast to coast in the United States accomplishes nothing…except it foments more and more hate. Somehow it needs to stop. This graffiti in Exton isn’t art, nor is it a political statement. It’s just hate. Please stop the hate. Hate has no home here at Christmas or any other time. 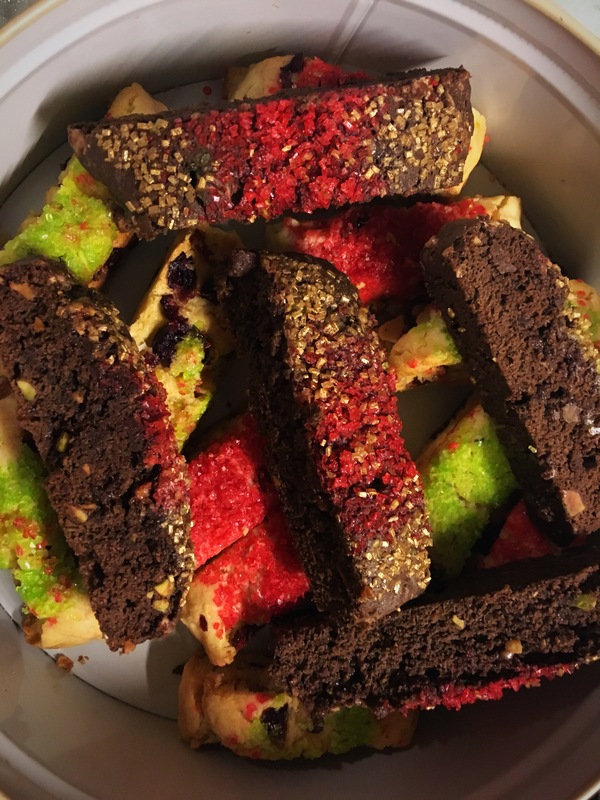 Christmas always means biscotti, or should. Only my inner Italian hadn’t made them in a few years. So, I decided to drag out my recipe and tweak it. Biscotti, also called cantuccini, are Italian biscuits that originated in Tuscany if memory serves (traditionally almond or anise) . They are twice-baked, oblong,crunchy, and delizioso. The word originates from the medieval Latin word biscoctus, meaning “twice-cooked.” They are also so truly uncomplicated and simple to make that I reminded myself today I should make them more often. I updated my recipe and tried a new twist. 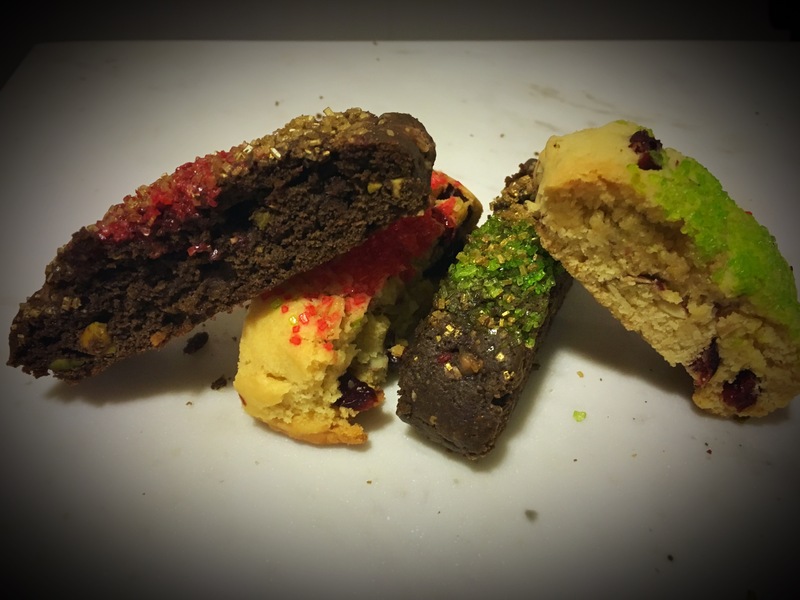 I created Cranberry-Almond and Chocolate-Pistachio Biscotti. And yes they are that good. I blame Ancestry.com for making me remember my Italians today! In a big bowl, beat the butter, sugar, salt, extracts, and baking powder until the mixture is smooth and creamy. Beat in the eggs; the batter may look slightly curdled. At low speed of your mixer, add the flour, stirring until smooth; the dough will be sticky. REFRIGERATE the dough a couple of hours wrapped tightly in plastic wrap. ( A lot of recipes and chefs say you do not have to, but I refrigerate a lot of my cookie doughs before dividing and baking.) Allow to warm up about 15 minutes before dividing and shaping. Wait 5 minutes, then use a sharp serrated knife to cut the log crosswise into 1/2″ to 3/4″ slices. 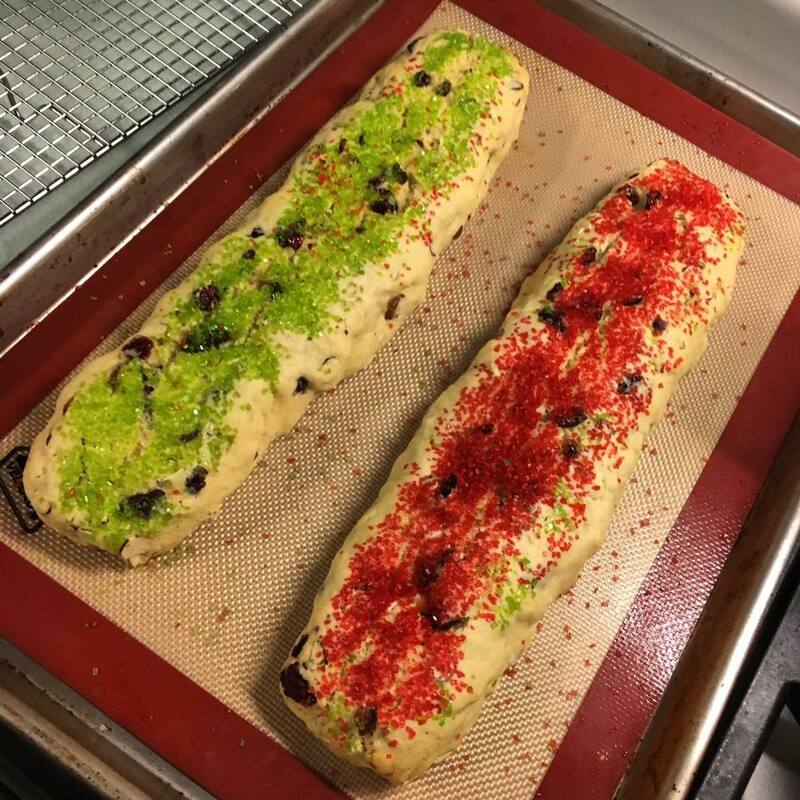 Be sure to cut straight up and down, perpendicular to the pan; if you cut unevenly, biscotti may be thicker at the top than the bottom, and they’ll fall over during their second baking. Set the biscotti on edge on the prepared baking sheet. 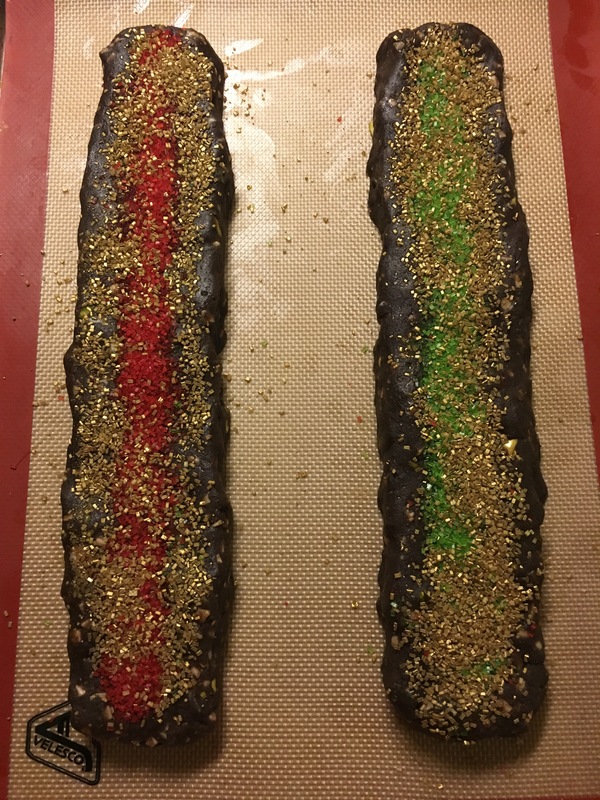 Return the biscotti to the oven, and bake them for 25 to 30 minutes (NOTE: Chocolate ones took almost 32 minutes on the second bake), until they feel very dry and are beginning to turn golden. They’ll continue to dry out as they cool. You will get about 30 biscotti a batch depending on size. Sometimes a couple less, sometimes a couple more. Depends on the dough Lincoln logs. A few weeks ago, one of my friends was telling me how she had discovered family. Now for her, that is no easy feat, as she was adopted and it was a closed adoption. She did not know where or who she came from, other than she was born in Philadelphia. So she did one of those Ancestry.com DNA tests. Through that, family of her birth mother contacted her. She found out where she was from and her mother had traveled to Philadelphia to have her baby, and gave her (my friend) up for adoption. I am not adopted, but having a curious mind I would love to learn about the melting pot that is my family. I am Italian, Irish,and Pennsylvania German. So I have ordered a DNA saliva kit to send away through Ancestry.com. It’s not here yet, but when you buy it (and it’s on sale right now through the holidays) you get a temporary membership. I am not sure what I will do after the trial membership is up, but right now I am like Alice falling down the proverbial rabbit hole. On my husband’s side, I have traced back so far to a third great grandmother on his maternal grandfather’s side. I even have seen a photograph of her marriage record in 1830 in the Kennett Friends Meeting. 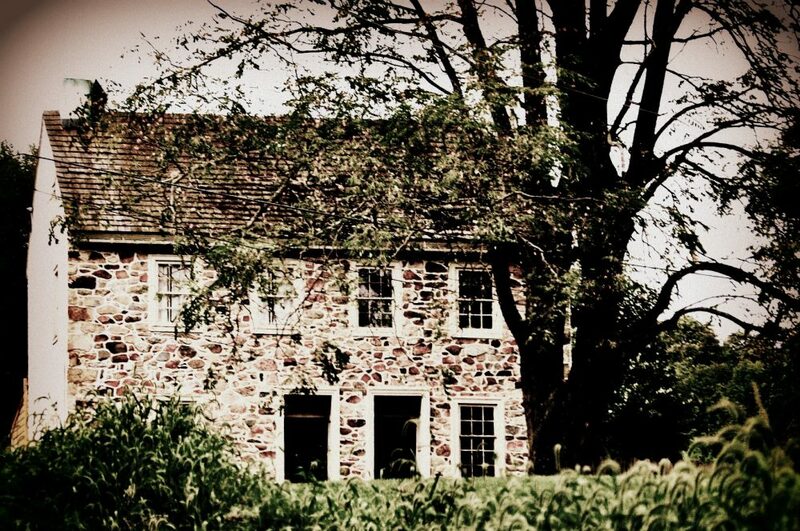 I am assuming it was the meeting house which was founded in the Borough of Kennett Square around 1812 but I am not sure because in the 1820s there was a split into other meetings. Something to do with factions of very liberal Quakers and very conservative Quakers. Some went to the Old Kennett Meeting House, and others to the Parkersville Friends Meeting House (also apparently known as Kennett Preparitive Meeting of Friends. My husband’s family on his mother’s side via his maternal grandfather goes back well into the 18th century so far. His mother was born in New Jersey, but her family has deep roots in Chester County and the State of Delaware I am learning. On his father’s side, I have gotten as far back as his paternal grandparents and turn of the 20th century. I have not so much for his maternal grandmother as of yet. My family is more of a tale of immigration. On my father’s side, maternal and paternal grand parents (my great grand parents) came to the United States from Italy in the 1870s. I have been unable thus far to track prior to them arriving in the United States. It was really cool to see some of them on ship passenger lists! I have discovered some emigrated to the US and were in Alabama for a while of all places! On my mother’s side, we have Irish and Pennsylvania German. I have hit a brick wall with the German side (maternal grandmother’s parents or my great grandparents) because although they have unusual last names for me, in Lancaster County and the coal regions of PA, my maternal great grandmother from the German side is like a German equivalent of Smith. I only just figured out my maternal grandmother’s maternal grandparents’ names (I think!). I think I have located a 2nd great grandmother born in Germany in 1853. We have miners apparently, tobacco farmers and tobacco shop owners. On my mother’s side, we also have the Irish. That would be her paternal grandparents, my great grandparents who died long before my mother’s parents married. I have been able to go back to 2nd great grandparents.Two sets, both from Ireland. Starting in 1825. And that is as far as I have gotten. No ship’s passenger lists as of yet to see WHERE my Irish hail from, although I was told long ago some from Northern Ireland, although all were Catholic. I found a blacksmith in my tree! I know what I am from, but to see it laid out is kind of cool. I will now wait and see what the DNA test will tell after I take it and send it back. If you are interested both Ancestry.com and 23andMe are running specials. You can also buy the kits from either of them right off of Amazon.com. I will note I am NOT being compensated by any of these DNA/Geneology outfits to write about this. I have always wanted to do it, so I finally just did. I should also mention I tried Geni.com a few years ago, but did not find it as easy to use, or as interesting or staisfying. One of my cousins on my father’s side used that site to compile information. Back to the Christmas baking. Thanks for stopping by.